We set off with a true sense of adventure, the task to explore a completely new locale. A plan was hatched as the class stood and looked into the wooded area – some would go that way, others the other way and we’d meet on the top of the hill. One of the first finds was a small gap between two large tree trunks – a secret entrance! Everyone squeezed through to enter the new land. We were now in the newly child-named land of Cowallet. The feeling of excitement grew to giddiness – what would we find in this land?? Itty bitty mushrooms, a garden tag, and a tree that grew bark right over parts of an old fence – as if the wire was poked in on purpose. A child volunteered to climb the tree to help us get our bearings. Could she see the golf course? What was over the hill? Too many other trees were in the way to tell. Everyone gathered to rest in the fallen leaves and we sang Going on a Bear Hunt. This had been a great adventure. *Excerpted from the Spring Room daily email to families of the preschool class. How we interact with a place influences what it means to us. Think back to the places which helped define childhood. Were we told how to behave in the space, or given free range? Could we choose the paint color, or was it forbidden to leave fingerprints on the wall? Did we build forts and redirect streams or were we too nervous to leave the trail? For young children, emotion is the primary attachment factor, determining which places stay with us as we grow. At All Seasons, a positive emotional attachment to our outdoor space is the goal. And stewardship is a hopeful result of sense of place. The quality of our interactions with places matter. 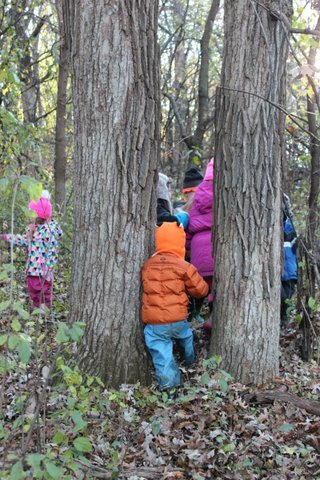 With preschoolers, time to explore independently and as a community is balanced with an adult’s sense of wonder and appreciation. What does that look like at All Seasons? ~ We keep it playful. Every space offers a chance for pretend play. ~ We repeat visits throughout the seasons. The Swamp is transformed after a period of rain. ~Problems and challenges can be solved bit by bit. Pulling Buckthorn can be done in stages. Children can learn how to use sticks safely with practice. ~There is comfort knowing we can always come back. Forts can be worked on when interest swells. ~ Children have a say, helping decide where to go. A fire to roast apples in The Boulders can be planned and anticipated. A request to see if the Fairy House has changed can be easily accommodated. ~ Risks are allowed, and even encouraged. Balancing on fallen tree limbs or flipping over logs to see insects in The Woods takes courage. ~ Resilience is built when accomplishments accrue. Climbing into The Dinosaur Tree can take months of trying. Climbing up the sledding hill on The Golf Course takes patience. ~Families are kept informed of the spaces we explore through daily emails. ~ Teachers are always looking for ways to extend and expand experiences. In Cowallet, a newly named area of the woods, we planted seeds to return to. Yarn was brought to The Pines to expand the booby trap play. Journals, snacks, and books become more interesting in unexpected places. In the end, we are building memories. Some bind the classroom community through shared experiences, and some connect individuals to specific places. We are doing our best, nurturing a sense of place and growing stewards. What have the children been up to this summer? Imagine the things YOU did as a child in the summer; that is precisely what we did at All Seasons Preschool. Climb trees. Dig in the garden. Have a picnic. Play hide-and-seek in the meadow. Build a fort in the woods. Get dirty. Roll down a grassy hill. Endless hours outside. These are the elements of which summertime memories are made. Last week I walked our dog through our neighborhood park, the same park I’ve walked through almost every day for fourteen years. For possibly the first time, I saw young children (ages 7-10) at the playground without an adult present. This was so remarkable that I had to slow down to watch for a while. The neighborhood kids at the park in the absence of an adult was not the only thing that attracted my attention, the nature of their play was entirely different than what I see on my walks there. Seven children huddled together, discussing the rules of their game of tag; who was IT, what bases were safe zones, and which parts of the park were off-limits. There were brief negotiations, but no arguments and certainly no fights. This was all accomplished without any parental input and everyone was happy enough to play the game. No parent stepped in to “rescue” the person who was unhappily selected to be IT, to negotiate the safe zones, or to remind everyone to take turns. Everyone was satisfied ENOUGH to play. Children, given the opportunity, understand that in order to be part of the play, they must sometimes concede to the wishes of others. Not once did I hear, “Watch me do the monkey bars! “ or “Push me on the swing,” or the worst, “Come take a video of me going down the slide.” These children were not preoccupied with being the center of an adult’s attention. Rather, they were completely immersed in an elaborate game of tag with rules they came up with on their own. So engrossed were they in their game, they did not even notice me or my dog, who they always ask to pet when I walk past their homes. Absent was the erroneous belief that one must be the focal point at all times. How freeing for a child to know they can exist and have fun even when Mom or Dad isn’t there to watch or to document it for the scrapbook. Breaking down this play, these young children were required to plan, organize, and make decisions on their own. Socially, they all needed to exhibit some flexibility and self-regulation in order for the game to succeed. Most obvious, each individual was immersed in vigorous exercise for an extended amount of time. This gift of free play in early childhood, is offered each day, under the careful supervision of teachers who trust in children’s ability to regulate their own play.